ADRENALINE MOB claims to have learned via Twitter that the band's bassist, John Moyer, will be sitting out the group's tour in September. Earlier today, Moyer posted the following message via his social-media sites: "Thanks to all the ADRENALINE MOB fans for the support! Unfortunately I will NOT be joining them on this next run. My best to Mike Orlando, Russell Allen and AJ Pero. Have a great tour, guys!" Moyer's message was followed by the following statement on the official ADRENALINE MOB Facebook page: "We ADRENALINE MOB are totally shocked by John Moyer's announcement via Twitter today that he will not be touring with us in September. We knew he had some other commitments that might have caused him to possibly pull out but we were hoping to have him on board. Obviously he's got something else going on. 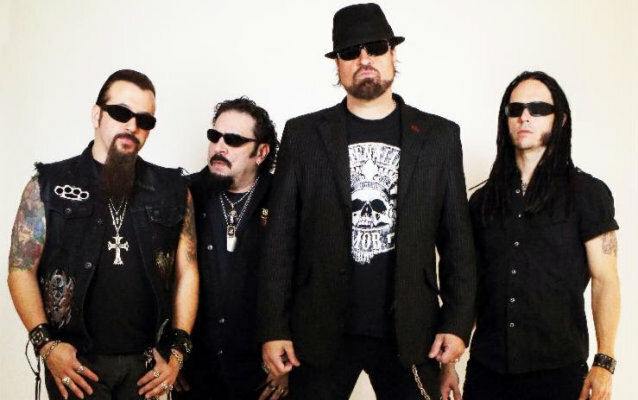 We wish him all the best and he will be missed but ADRENALINE MOB WILL be doing the shows... We will announce the new bassist as soon as we have one." **UPDATE**: Moyer has since offered the following clarification: "I didn't think I was so special lol!! "Just so everyone knows, the reason I'm not going out with ADRENALINE MOB has nothing to do with DISTURBED or Geoff Tate's OPERATION: MINDCRIME. I'm finishing two production projects with the bands WRETCHED SKY and FAVOR THE FALL. I'm also producing the bands WARRIOR SPIRIT in August, ASCENDING FROM ASHES in September and 1 ECHO 1 in October. I will also be overseeing big plans with my rock school John Moyer's Natural Ear Music School in the fall. "I will keep everyone in the loop on these great bands I'm working with and the growth of my school. "And also I need some personal time at home.